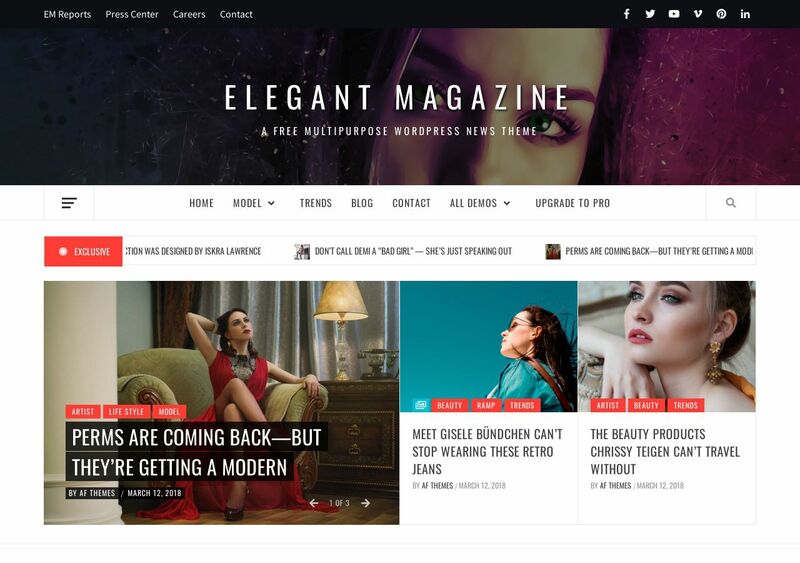 Elegant Magazine is a free magazine theme loved by tens of thousands of users. It’s a combination of eloquent thinking, fashionable design practices, and an original approach to web design. Themes like Elegant Magazine are generally popular amongst publishers and writers who are ready to take the next step in content production. From the moment you stumble on the homepage, it’s clear as day that Elegant Magazine focuses on trendy news posts. You can install demo designs like news portal, minimal magazine, architecture, interior, and travel magazine. Each design boasts a unique personality, but you have the choice to pick and choose from different elements to make a unique magazine design of your own. Be sure to check out the Pro version of this same theme because it’s a showstopper! Copyright © 2019 FRT – Powered by Customify.